So you picked yourself up a new Apple Watch, but for what you’re using the watch for, the stock band it comes with just isn’t professional or luxury enough for you. That said, you’re going to want to shop around for a luxury Apple Watch band that can replace your stock one easily. The band has a lot of effect on how the Apple Watch appears, so this isn’t an area that you really want to cheap out on either. But, with so many choices available for the Apple Watch, which one do you possibly choose? It’s a difficult decision, but that’s why we’ve assembled the five best luxury Apple Watch bands for you. If you follow along with us below, we’ll show you our top seven picks for the Apple Watch. Let’s dive right in! 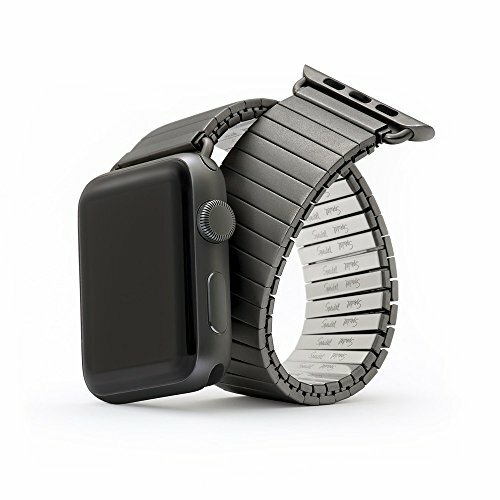 Coming up as first on our list, we have the Apple Watch ‘Stingray’ Band. This one is a really unique band that is handcrafted out of California. These aren’t mass produced, and are actually created upon order. These are made out a really unique leather, almost having an alligator appearance to them. That said, there are a number of vibrant and sweet looking colors that you can choose from as well. This one screams handmade luxury, but can be used for men or women. One of the cooler things about this Apple Watch band is that it works with all Apple Watch models — Series 1, 2, 3, and 4. These come with an adapter buckler as well. Looking for an Apple Watch band that’s really going to shine and show off your new watch? Then you’ll definitely want to see what the Stainless Steel Wrirstband has to offer. It has a nice finished premium stainless steel metal that looks and feels luxury, giving your Apple Watch some additional nobility, elegance, and even durability. It has an adjustable length, and is compatible with all Apple Watch models on the market. We think the Silver/Black color combo really makes this one shine, though there are a handful of other color options available as well. Coming in as number five on our list, we’re taking a look at the Mkeke Leather Apple Watch Band — if you’re looking for traditional luxury leather, this one will be right up your alley. 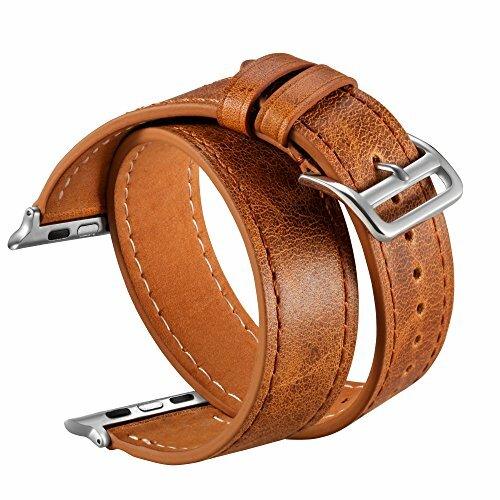 It has excellent craftsmanship in this leather band, craftsmanship that far exceeds what its cheap price tag. The stitching looks excellent, and the leather is actually sweat-resistant. Mkeke offers this one in both Black and Brown. There’s multiple holes in the Mkeke, allowing you to adjust this one to almost any wrist size. The fourth contender for the best luxury Apple Watch band is the Stainless Steel Milanese Loop by BRG. This one is, as the name implies, made out of high quality stainless steel. 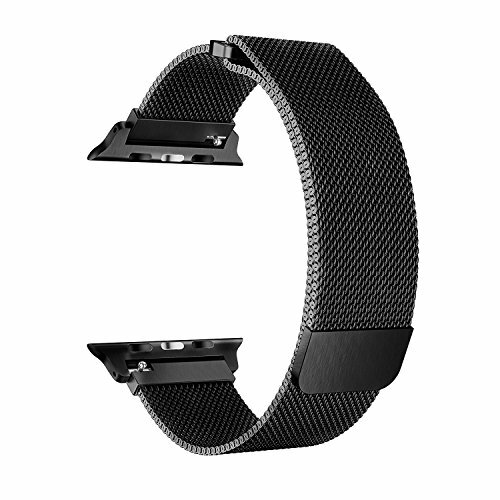 There’s no buckle here, as the Milanese Loop wraps around your wrist and connects together using magnets. It’s fairly comfortable, and compared to your traditional stainless steel strap, it’s fairly lightweight as well. BRG actually throws in an 18-month warranty with their wrist strap to keep you protected from any defects or problems with the wrist strap. Third up on our list is the V-Moro Double Tour Leather Apple Watch Band. This one is the definition of luxury, giving you enough leather on your wrist band to wrap around your wrist twice to provide a fairly unique look. You’re essentially gets a Hermes style luxury wrist band here, but at a much cheaper price point. This is because V-Moro does use genuine leather; however, the quality inside is excellent. The stitching is nice, and because of the quality here, this one will last you for years to come — V-Moro even includes a lifetime warranty with your purchase to help you ensure that this one lasts for years. Coming in as our second contender, we’re taking a look at the Spidel Stainless Steel Watch Band — if you’re looking for a traditional stainless steel band with links and a buckle, this one will be right up your alley. Speidel has put a lot of quality into this one, which does bring with it a pretty high price tag — a whole $80. However, the watch feels extremely comfortable, though it does add some weight to your Apple Watch. It’s available in black, silver, and a brushed color. You can pick it up in 38mm and 42mm sizes. 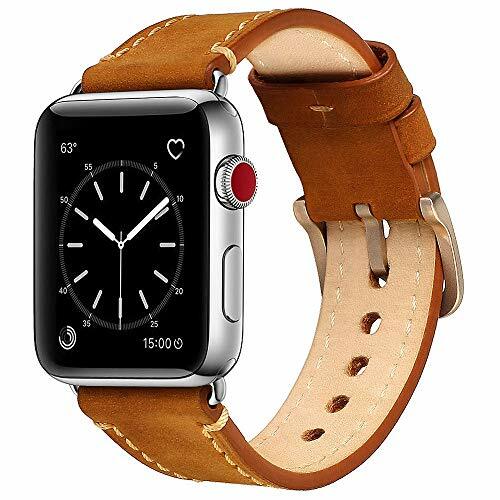 The first and favorite luxury watch up on our list is the LDFAS Natural Wood Apple Watch Band — this one is one of the most unique bands that you can find for the Apple Watch right now. 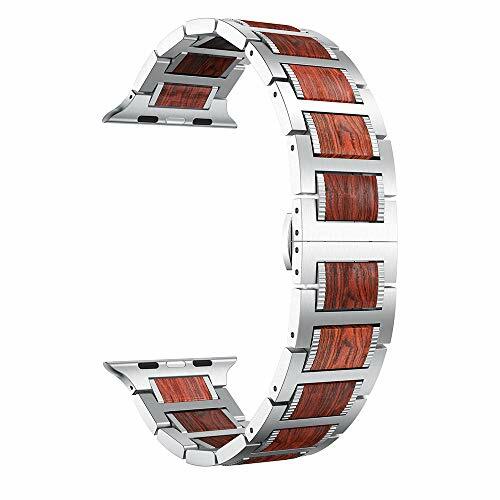 Not only does it make a stylish and excellent first impression on others, but the Natural Wood feels comfortable and lightweight on the wrist. It’s actually not all Natural Wood here — it’s wood woven in-between a stainless steel link frame. 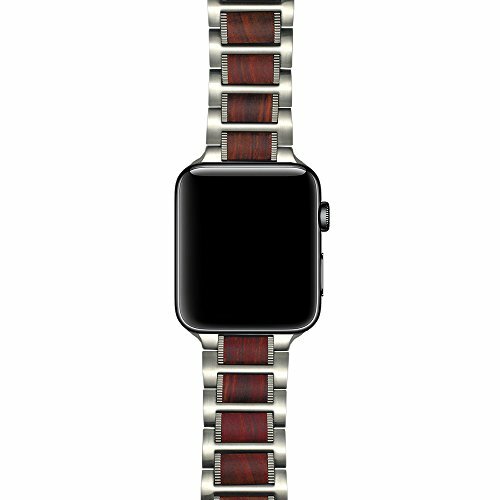 This one comes in both 38mm and 42mm sizes, and you can choose between a natural wood or a red wood. As you can see, there are a lot of different styles of luxury Apple Watch bands that you can pick up — the best depends on the type of style that you’re looking for out of an Apple Watch band. If you’re a leather kind of person, the traditional Mkeke Lether Watch band will be right up your alley, or if you’re looking for something more unique, you might like the V-Moro Double Tour more. However, both the LDFAS Natural Wood band and the Stainless Steel Milanese Loop are excellent options for great first impressions.